If you are finishing up research, are a senior, or are in the honors program, you may be starting a research thesis soon. I currently am beginning to compose my honors thesis for the research that I have been doing for the past three years. 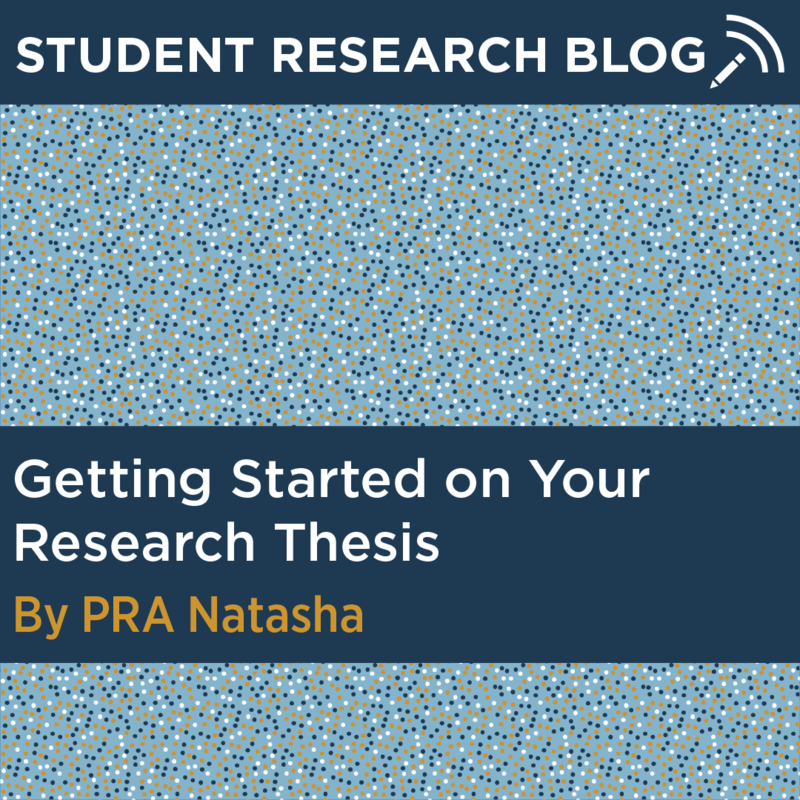 This definitely sounded like a daunting task, however hopefully this blog post can eliminate some of your fears and help you tackle and get started on your thesis! What is a research thesis? A project’s final product, often an essay, that contains a major focus. Many students write a research thesis to illustrate the work that they have done and research findings they have discovered. My thesis will be a written compilation of past manuscripts and data I have collected these past few years and its significance to the field. Why should I write a thesis? I can definitely say that writing a thesis is more than just the act of writing. You need to be able to time manage, work with other professionals, and most importantly stay motivated and driven by creating goals along the way. I know I will feel accomplished when I complete my thesis, which will represent all of the hard work I have put into my research. 1. Picking a topic. Have an idea of what kind of thesis paper you are writing. Are you composing a literary review to inform people on a specific area? Or are you persuading people of a new innovative technique discovered in your lab that is useful in the field? 2. Making an outline and working with your thesis supervisor. Once you have a specific topic down, it is important to draft an outline with your thesis supervisor. Meeting and developing a plan together is important so that everyone is on the same page and both have equal expectations on the requirements of the thesis. Doing this with my supervisor helped me because she had the experience of writing several theses and she was great at guiding me in the right direction. She assured me by helping me develop chapters and subsections within each. This allowed me to organize my thoughts into categories so I know what to write about for each. 3. Start early. Many people are overwhelmed by the length and final deadline a thesis may have. Students may have months to complete it and regret starting too late, which can cause added stress. I find it easier to set early deadlines for key parts of the essay, to ensure that the thesis is on track and not rushed. Setting early deadlines also can help eliminate some anxiety and allows for some extra time for review and editing. I have set deadlines for specific chapters of my thesis. These goals have allowed both me and my supervisor to stay on track to the final deadline at the end of the semester so that neither one of us rushes and submits an average product. This has definitely helped me feel better about tackling my thesis and has decreased any stress I previously had. 4. Get it reviewed. As you finish your thesis it is necessary to get it reviewed by people you trust, including someone who does not know much about your project. This is valuable because often writers may be stuck in their own heads and focus on tangents without knowing it. A fresh pair of eyes is great! Having your supervisor read it is also valuable as they have skills and experiences in the field and can advise you on specific research ideas or thesis components. And don’t forget about the Writing Center. They can provide guidance on the overall organization and writing. Natasha is a senior majoring in Molecular and Cell Biology. Click here to learn more about Natasha.